Made of rubber and incredibly resilient to the elements, car tires can easily hang around for many years after their tread has long worn off. Even though used tires can be carted off to the local recycling center, they can also be used in a lot of nifty ways around the house. Here are five creative uses for used car tires that you should keep in mind when you visit the tire shop to get a new set. 1. Create an Ottoman - Grab two circular pieces of plywood the same size as the opening in the tire, and use wood screws to attach the wooden circles to both rounded openings. Grab a hot glue gun and a good spool of rope and cover the tire completely for an attractive ottoman that will fit in in just about any room in the house. If you don't like the roped look, invest in some padded upholstery and cover the tire completely, attaching the material at the base with a heavy-duty staple gun. 2. Design Your Own Man Cave Tables - Every man cave needs a table for holding cold drinks, so why not make sure this table perfectly fits into the scheme of things? Grab a stack of old tires and join them together with a few screws, and coat them with a layer of paint of your choice. Create a table-top surface with a piece of thick glass, which will stay fairly stable without much effort because of the rubber tires that support it. 3. Build a Playground Tunnel - Stand the old tires upright and then bury the lower portion about a third of the way beneath the ground, adding wooden pins for support if necessary. By standing several tires in a row in this fashion, you can create a fun tunnel play area for your backyard that your kids will love. Make the tires more kid-friendly with coats of colorful paint and fun designs. 4. 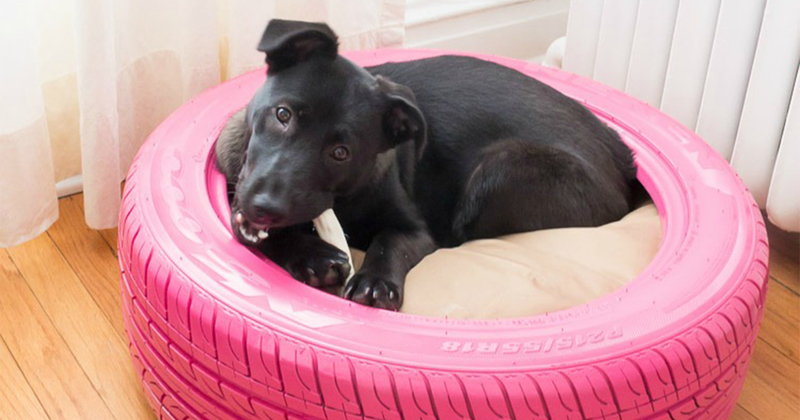 Give Your Pet a Sturdy Bed - If you are tired of the flimsy bed that Fido drags all over the house, make him a stationary bed using an old car tire, some stuffing, and a piece of fabric. Place the tire where you want it, fill the center with cushy fiber fill, and cover the cushioning with a piece of fabric, attaching it just inside the rim of the tire with hot glue or staples. If you decide to get a little crafty with used tires, keep in mind that these are fairly easy to find. Stop in at a tire sales and service center such as Jensen Tire & Auto if you don't already have access to tires that you can use for your own crafty tire projects.